An examination of San Diego’s Point- in-Time Count and what it reveals about homelessness trends. Every year, a large number of Father Joe’s Villages staff volunteer for the annual point-in-time count. The Regional Task Force for the Homeless reported that 1,788 volunteers participated across 68 deployment sites in 2017. In April, San Diego’s Regional Task Force on the Homeless (RTFH) published their yearly We All Count data and analysis. We All Count is an unduplicated count of sheltered and unsheltered homeless individuals and families in San Diego. It is also commonly known as the point-in-time count. The annual count is required by The U.S. Department of Housing and Urban Development (HUD) in order for communities to receive HUD funding for homeless services. It provides a snapshot of who is homeless on a given night, but it doesn’t necessarily help us understand the total number of people experiencing homeless during the course of a year. The 2017 point-in-time count occurred on January 27, 2017, from 4 a.m. to 7 a.m. Regional 5-year trends: The yellow line shows that the total number of individuals who are homelessness during the point-in-time count rose 3% between 2013 and 2017. For the second year in a row, the unsheltered homeless population grew while the sheltered population fell. The unsheltered count increased by 13.8% from 4,940 to 5,621 individuals. The sheltered count decreased by 6.3% from 3,729 to 3,495 individuals. We often hear people make assumptions about why people live on the streets. These assumptions include a belief that people who are homeless choose to live on streets or don’t want to live shelters and the notion that there has been a decrease in the number of emergency shelter beds. Neither of these assumptions are backed by the data in the RTFH report or the current conditions in downtown. Utilization rates for emergency shelters jumped from 71% in 2016 to 90% in 2017. However, Father Joe’s Interim Emergency shelter (also known as Interim Housing) and other downtown emergency centers stay at 100% capacity. The RTFH report also shows that the number of emergency shelter beds increased from 1,566 in 2016 to 1,736 in 2017. This means the county gained 170 beds. The largest gain occurred in the City of San Diego, with an increase from 885 beds in 2016 to 1,240 beds in 2017. Additionally, there is evidence that people currently experiencing homelessness want shelter: Father Joe’s Villages’ Interim Emergency Shelter wait list ranges from 150-200 people each day with over 50 families waiting to get into interim housing for families. 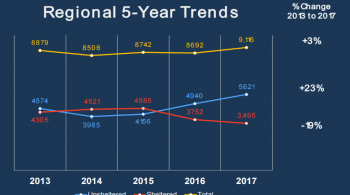 This graph demonstrates the utilization rates of Emergency Shelter, Transitional Housing, Permanent Supportive Housing and Rapid Rehousing in 2015 (blue) compared with 2016 (gray). While there has been an increase in the number of emergency shelter beds, it is important to note that community has experienced a decrease in Transitional Housing beds. The number of beds decreased from 3,065 in 2016 to 2,306 in 2017 a loss of 25% (759 beds). The decrease in Transitional Housing is in line with Housing First recommendations; However, the Housing First beds needed to replace the loss of Transitional Housing has not kept pace. The county has seen an increase of 614 permanent supportive housing subsidies but a loss of 75 rapid rehousing subsidies. Significantly, while some permanent supportive housing is tied to an actual apartment unit, some is not. This means that the people who are the most vulnerable, like those experiencing disability, must compete for the scarce affordable housing available in the rental market. All rapid rehousing support must find units in the rental market. The decreased inventory and the competitive rental market contributes to more people on the streets for longer periods of time. There is hope on the horizon. Father Joe’s Villages has proposed a project, Turning the Key that will replace the lost Transitional Housing beds with 2,000 Housing First and affordable housing beds. With the increase in people on the street and decrease of beds, this is the permanent solution needed. Father Joe’s Villages’ weekly count shows an increase of 192 individuals and tents on the street within a quarter mile of our East Village campus, St Vincent de Paul Village, in the past year. 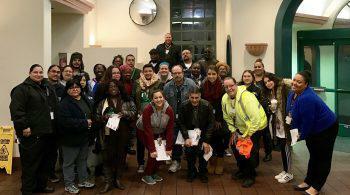 Clean and Safe has been compiling a monthly count of people living on the streets in the downtown area since 2012. In 2016, they documented an increase in number of people on the streets in the East Village. Their data also shows that the percentage of homeless people living in the East Village, when compared to the rest of downtown San Diego, has increased. For example, in 2012, 52% of currently homeless people in the downtown area lived in the East Village, in 2016 the East Village accounted for 69% of the downtown’s currently homeless people. The point in time count also shows a 10% increase in the number of people counted in downtown area and increase in the concentration of homelessness in the East Village. The We All Count numbers reveal a final point: Tents in San Diego increased significantly. Tents increased by 58% in San Diego County and 104% in Downtown San Diego from 2016 to 2017 (We All Count). Father Joe’s Villages’ weekly count also documented an increase in tents with a slight decrease in people counted. Tents provide needed shelter to those staying on the street. However, they add to the visibility of homelessness with tent cities popping up on sidewalks. 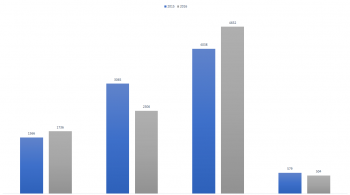 Overall these numbers point towards a growing need for coordinated and comprehensive services, as well as the construction of more affordable housing units in San Diego. These are not impossible tasks. Together, we can see all of San Diego shine. Paul DeLessio has been working at Father Joe’s Villages for over 13 years. Paul started his career at the agency as a Residential Specialist in 2001. He has served as a supervisor, team leader and program manager. Paul went back to school, while working full-time. He earned a Masters of Social Work from San Diego State University in 2013. Now Paul serves as our Director of Coordinated Services. 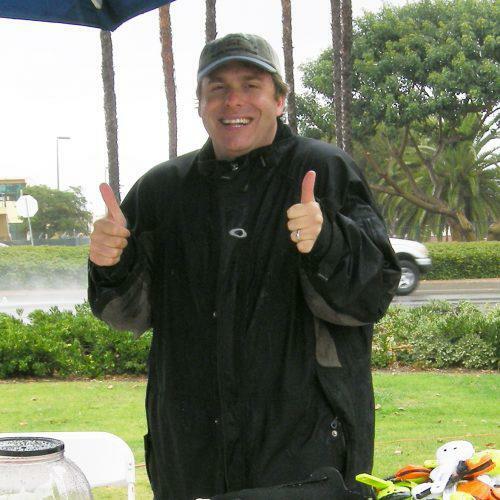 In this position, he manages dignity and outreach services provided to homeless adults at the San Diego Day Center. He also helps individuals access the resources they need through Assessment Services and Interim Housing.